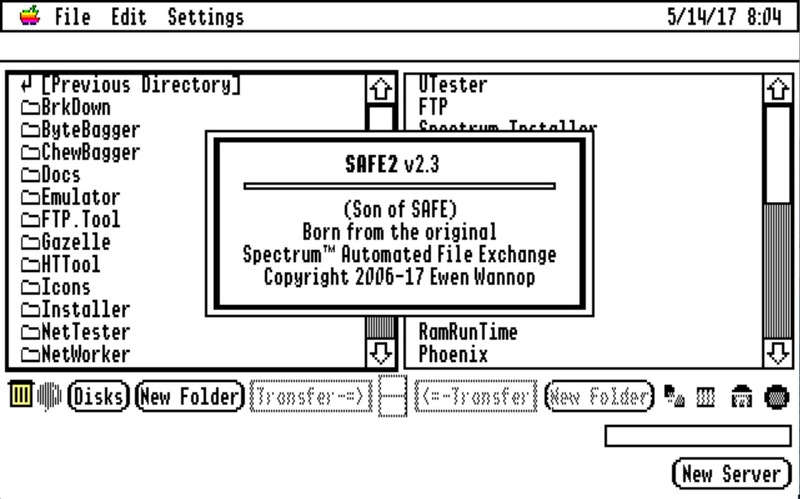 SAFE2 is a powerful stand alone FTP application for the IIgs. It has many useful features, such as Favourites, Synchronising folders, and Batch Transfers. SAFE2 uses a simple metaphor for FTP file transfers. Once you have logged into a host, your local files appear in the window on the left, and the host files appear on the window on the right. To copy files back and forth, just select the files and folders that you want to copy, and then click the relevant Transfer button. The files, and or folders, will then be automatically transferred from one window to the other. In addition, SAFE2 has a number of useful functions that simplifies accessing your favourite hosts, and that allows you to manage the files and folders at both ends. SAFE2 is a stand alone application, and requires a minimum of 1Mb of free memory. SAFE2 requires a TCP/IP connection through Marinetti 3.0 or later. Marinetti must be configured to access either your LAN, or the Internet, through one of the available Link Layers. Refer to the Marinetti instructions on how to get the appropriate Link Layer working for your preferred access.